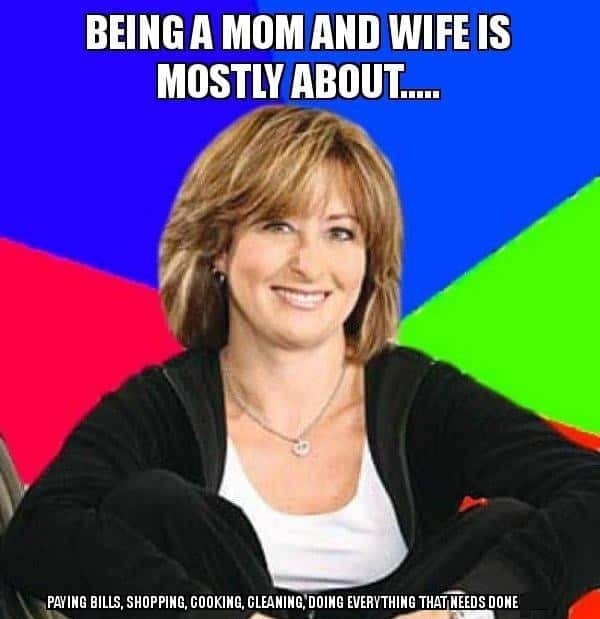 Being a mom memes compilations are simply one of the best content we have. There are so many funny situations about being a mom, that we simply get the most content out of them! 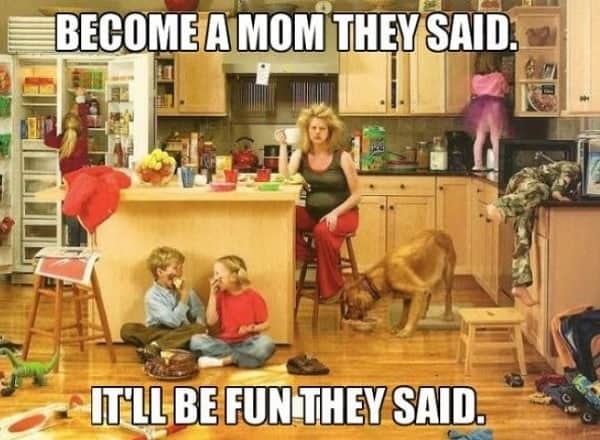 Moms have to go through so many things, have to deal with so many things, and their everyday lives are so full of surprises, that, of course, these being a mom meme compilations are simply hilarious. Not only moms have to deal with the usual stuff like taking care of their babies, but also have to try and carry a normal life while trying to raise a child, and that simply deserves an award. Since we don’t have an award to give to all of those precious moms out there, we have decided to simply put together this funny compilation about the best being a mom meme out there! So, whether you are a mom yourself, or you simply wanna laugh a little bit, sit down and get ready to enjoy our memes! Trust us. by the end, you will have laughed so much, you’ll thank us. 1. Hey Girl, Being A Mom Is Tough. But I’m Here To Tell You, You’re Doing A Great Job. 2. 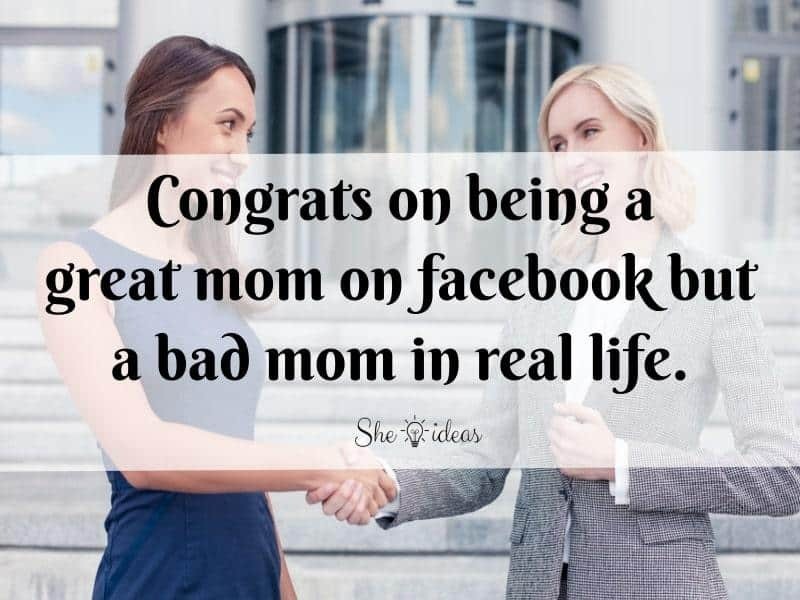 Congrats On Being A Great Mom On Facebook But A Bad Mom In Real Life. 3. Welcome For Being A Mom Of A Teenager. Prepare For A Large Amount Of Eye Rolling, Emotional Outbursts, And Thoughts Of Running Away. 4. 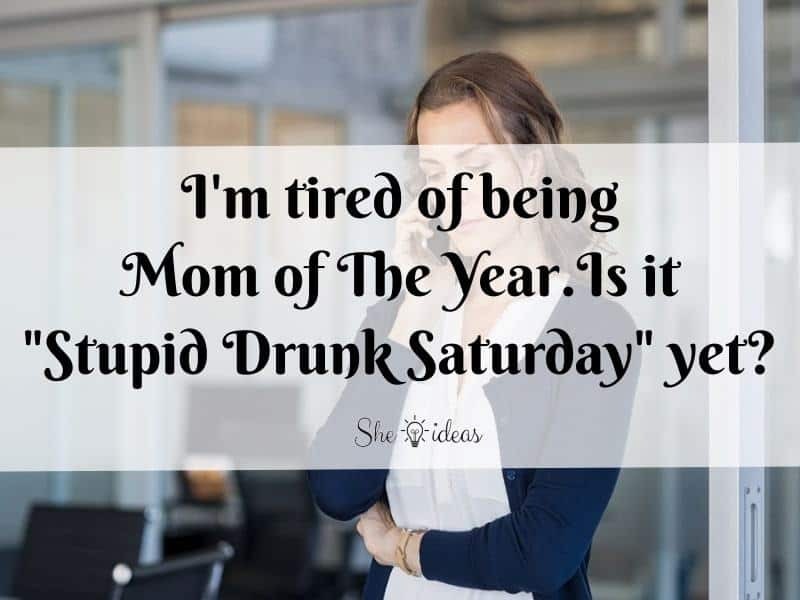 I’m Tired Of Being Mom Of The Year… Is It “Stupid Drunk Saturday” Yet? 5. Aw, You Think Being A Mom Is A Thankless Job? 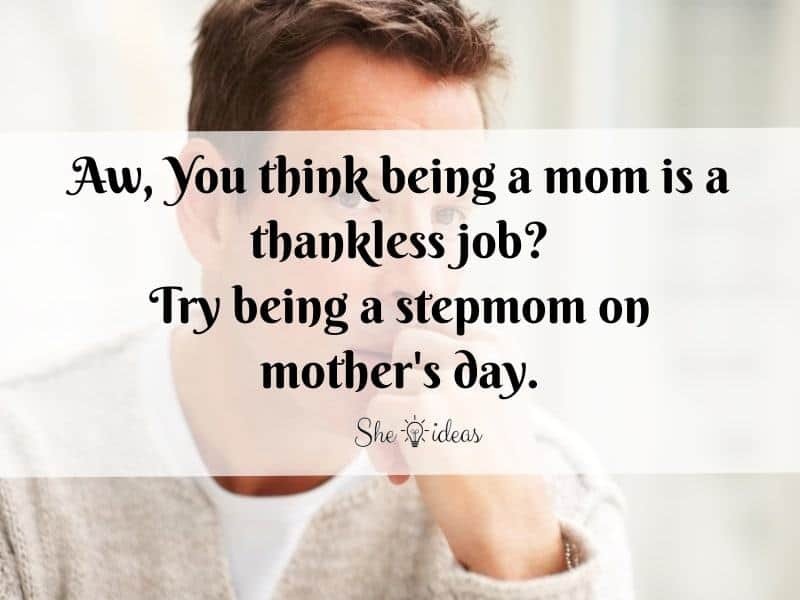 Try Being A Stepmom On Mother’s Day. 6. 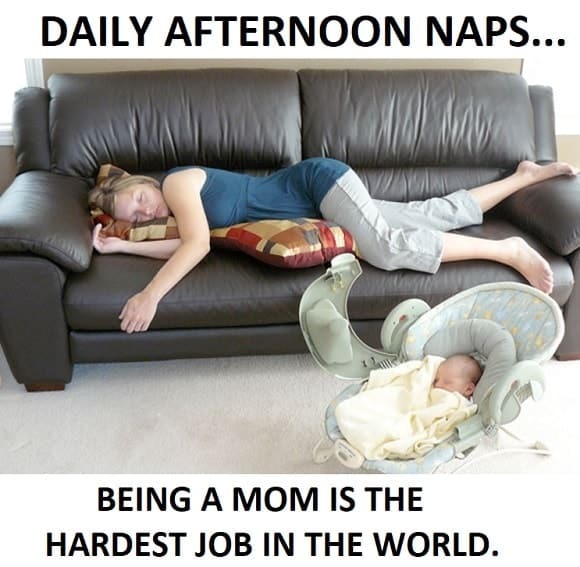 Daily Afternoon Naps… Being A Mom Is The Hardest Job In The World. 7. 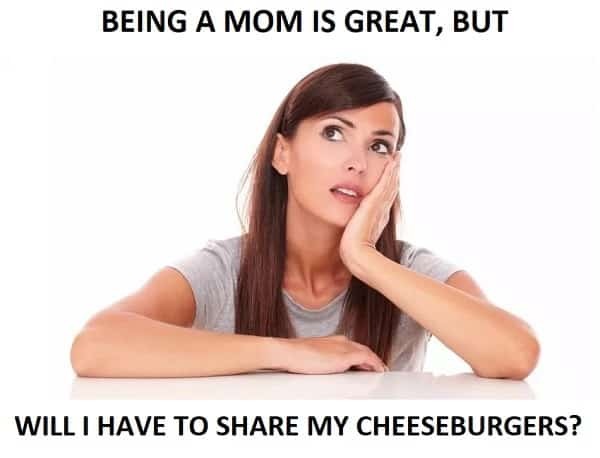 Being A Mom Is Great, But Will I Have To Share My Cheeseburgers? 8. Become A Mom They Said. It’ll Be Fun They Said. 9. Being A Mom And Wife Is Mostly about…Paying Bills, Shopping, Cooking, Cleaning, Doing Everything That Needs Done. 10. 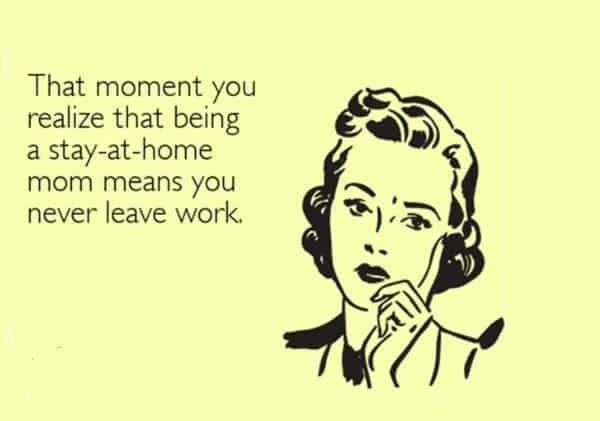 That Moment You Realize that Being A Stay at Home Mom Means You Never Leave Work. 11. I’m Banned from Being Snack Mom for The Little League Games. 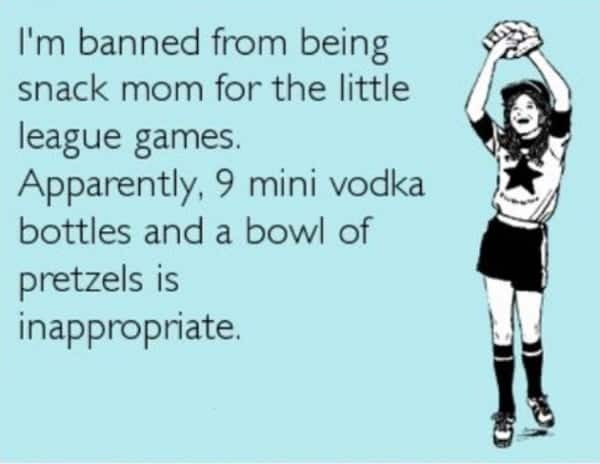 Apparently, 9 Mini Vodka Bottles And A Bowl of Pretzels Is Inappropriate. 12. 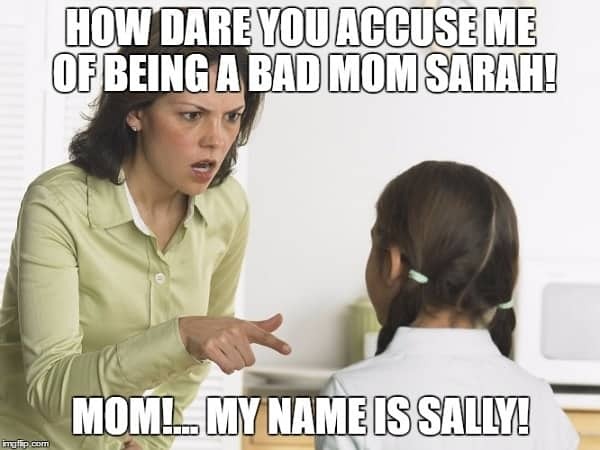 How Dare You Accuse Me of Being A Bad Mom Sarah! Mom!… My Name Is Sally! 13. 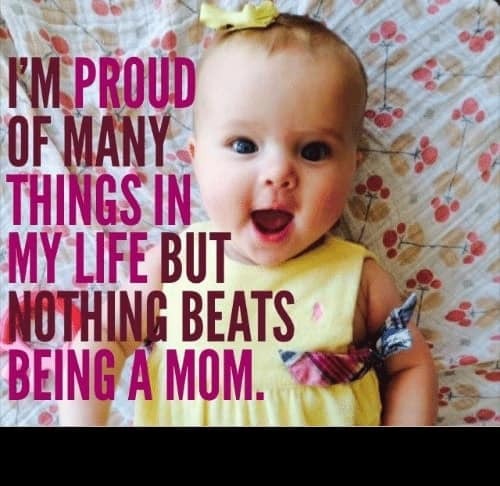 I’m Proud of Many Things in My Life But Nothing Beats Being A Mom. 14. Nothing More Beautiful Than A Woman Being A Mom! 15. 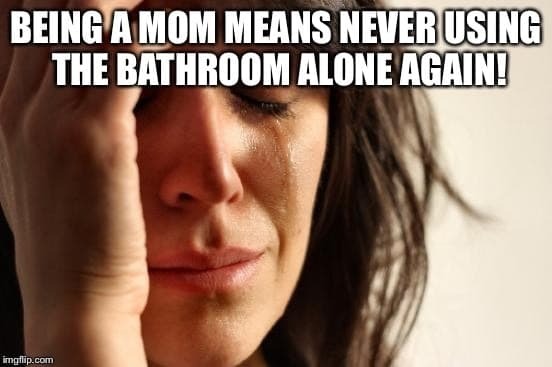 Being A Mom Means Never Using The Bathroom Alone Again! 16. 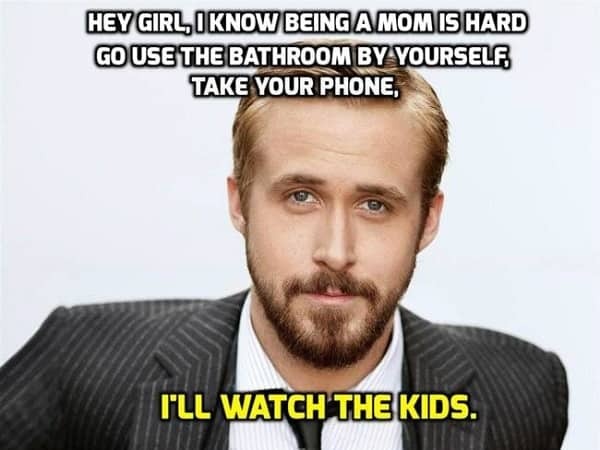 Hey Girl, I Know Being A Mom Is Hard. Go Use The Bathroom by Yourself, Take Your Phone, I’ll Watch The Kids. 17. 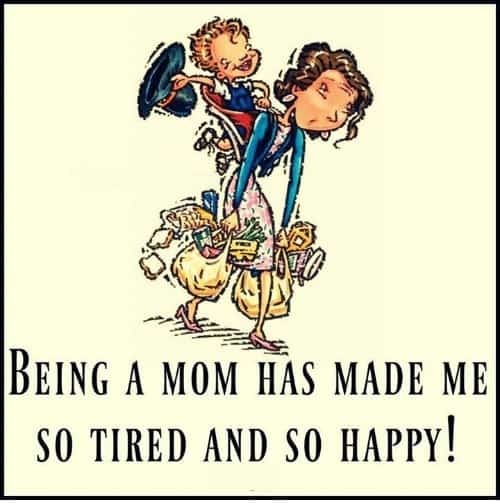 Being A Mom Has Made Me So Tired And So Happy! 18. 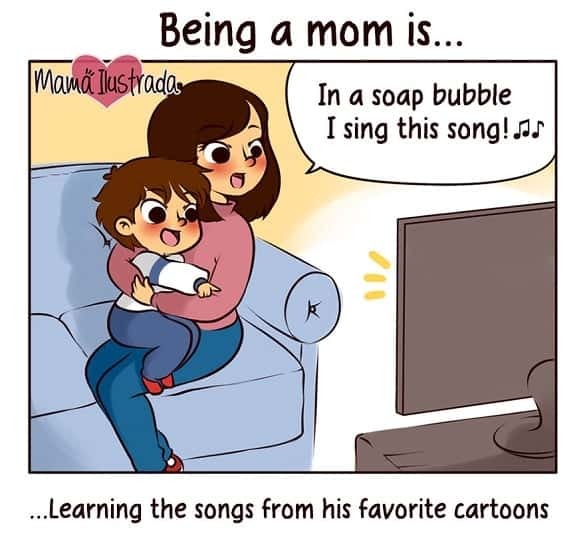 Being A Mom Is… “In A Soap Bubble I Sing This Song!” …Learning The Songs from His Favorite Cartoons. 19. 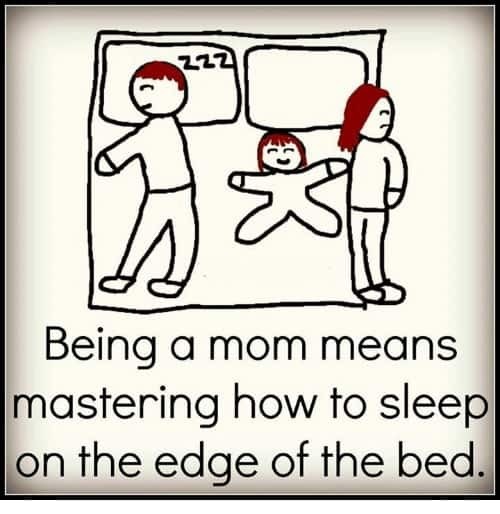 Being A Mom Means Mastering How to Sleep on The Edge of The Bed. 20. Being A Mom Isn’t An Easy Job. 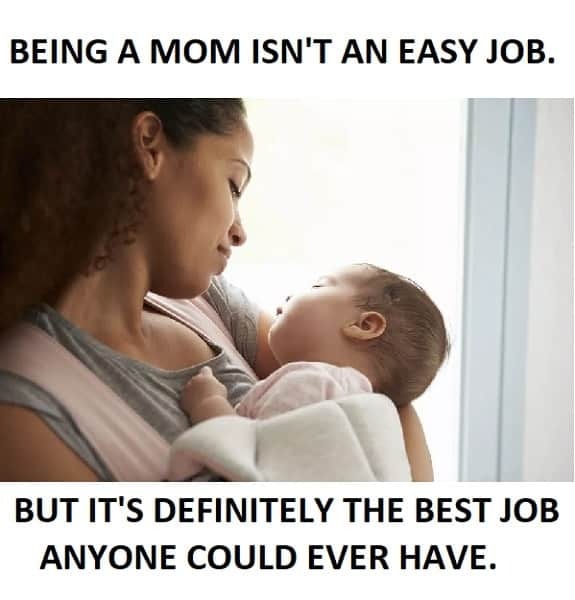 But It’s Definitely The Best Job Anyone Could Ever Have. And? Did you laugh? We bet you do! 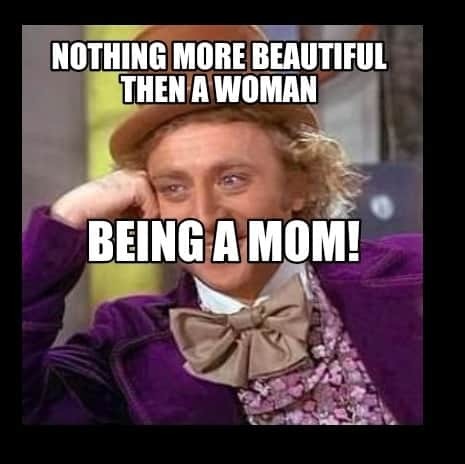 Nobody can simply resist these being a mom memes, they are just way too funny! And if you’re a mom, we bet you, you were able to relate as well. If you enjoyed our memes, then please remember to share them with your friends! Or even better, remember to share them with your mom! Make her laugh a little bit, she’ll appreciate it. Last, but not least, remember to check out our page for more memes! We have a bunch of them ready to make you laugh, so don’t forget to check them out as well.